Whether for special occasions or just having friends over, everyone needs a proper home bar. From bottles to tools, here's the blueprint to start your own. Looking for a first-class cocktail without leaving the comfort of your living room? Need last-minute drinks for a group of thirsty friends? 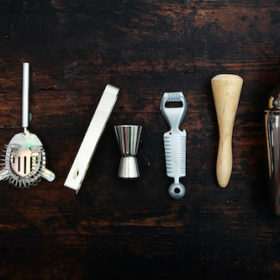 We’ve got you covered, from top tools to perfect pours. They came in with the 20th century, and they haven’t left. A well-stocked bar cart is a glam home essential, ideal to wheel out at parties and display favorite bottles when there’s no space for a full bar. When it comes to bitters, should you DIY or buy? The short answer is both. In addition to classics like orange bitters and the spiced-cherry profile of Peychaud’s, splurge on fanciful flavors like celery, chocolate mole or “tiki spice” to add complexity to drinks. But if you’re inclined to make your own, try aromatic bitters, which has an autumn-appropriate spiced profile similar to classic Angostura. It’s versatile enough to add to almost any drink. The following recipe makes a large batch, so consider giving a few bottles as gifts. Using vegetable peeler, zest lemon in strips, leaving white pith behind. In large sealable glass jar, combine zest and remaining ingredients. Seal and store at room temperature. Let steep for 2 weeks, shaking jar every 2 days. Strain the mixture through cheesecloth or a coffee filter into another large glass jar. Funnel into small bottles with droppers. Makes about 3 cups. An easy to build, punchbowl-ready cocktail, perfect for when you’re short on time. Just like the sharp-tongued writer for whom it’s named (Dorothy Parker, of the Algonquin Round Table), this drink may appear demure, but it packs a punch. Funnel first four ingredients into an empty 1-liter bottle. When ready to serve, shake well to mix, then divide among eight glasses (or pour 3 ¼ ounces into each glass). Scoop ice into each glass, and stir to chill. Top each glass with chilled seltzer. Garnish each glass with an orange wedge. Serves 8. What if someone isn’t in the spirit of things? Offer them a glass of wine. Here are four fail-proof offerings for that dispirited guest, courtesy of Beverage Director Ariel Arce, Air’s Champagne Parlor and Tokyo Record Bar, both in New York City. 2Bitters: Buy or Make Them?